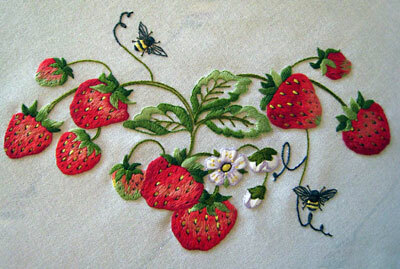 Another day for embroidered household goods – this one is a tea cloth, featuring strawberries. It reminds me of summer! Margaret sent along the photos of this pretty little tea cloth made from a Fleur de Lis kit, featuring Anchor threads. The strawberries are just gorgeous! Brand: Anchor/Fleur de Lis (European) – I bought it from a UK site. Problems with the kit: not enough floss. I am a very thrifty stitcher so if I run out, then there wasn’t enough thread in the kit. I expected to run out of yellow because I changed the kit, but I ran out of some of the reds and greens as well. Stitching: I stitched with two threads except for the bees which I did with single strands. If I remember correctly, I think the kit called for 3 strands. I followed the kit except that I changed the seeds on the strawberries. Where you see light yellow (as opposed to gold) the instructions said to use white. I thought the white was too stark. One thing that was a challenge was the stitching direction on the three leaves in the middle. (They are satin stitched with a stem stitch edge, not buttonholed.) Normally, I would have followed the angles of the leaves with longer stitches. Since this was not going to be a framed piece I needed to keep my satin stitches shorter and sacrificed the direction. I couldn’t have really long stitches on a tablecloth as they would be floppy. I love the Fleur de Lis tea cloth kits – I’ve got one in progress as well, but haven’t gotten back to it in ages. You can find them at various online shops in the UK, and you can view the range of Fleur de Lis kits on the Anchor / Coats website. 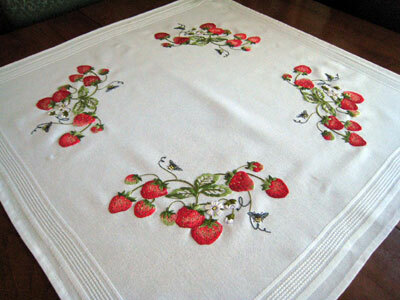 Well, Marlena’s tablecloth I posted yesterday and Margaret’s strawberry tea cloth have inspired me to dig out mine as well to see just where I left off on that! Thanks, Margaret, for the photos and the information! Mary, I just got ‘Spring Flowers’ out and started working on it a week ago. It’s going to be my travelling companion when I go on vacation this year. Beautiful! Absolutely stunning. I just ordered a lot of anchor thread from ebay and am off to look at kits. Hopefully they will get her quickly being they are in Britian and I am in Gemany. Happy stitching everyone! This is really gorgeous – your stitching is exquisite! I’ve learnt the hard way that embroidering most linens should be done using no more than two strands of floss, to capture the perfect look of your cloth. I have a cupboard full of SINS (Stuff I’ll Never Stitch) but your pictures have prompted me to get them out and make a start on something soon! Needle & Thread had a link to your spring flowers tablecloth and its absolutely gorgeous. The extra shades of colour make such a difference. What beautiful work! I love strawberries. Every bit of this is perfect. Thanks for sharing the pic.